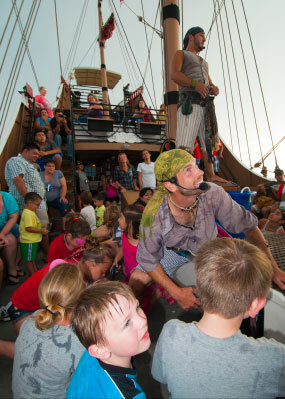 All ages can enjoy our 2 1/2 hour Pirate Adventure Experience! Please arrive 15 minutes prior to your ticket time to get parked, signed in, and attain your red boarding pass. We begin with our Dockside Show underneath the beautiful Palapa next to Fin’s Grill and Icehouse. 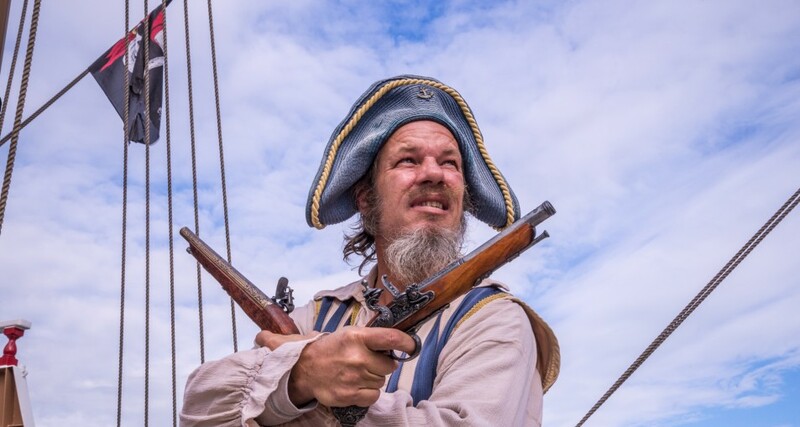 Then, you board the Red Dragon Ship with our costumed characters for an exciting cruise that includes: Sword Fighting, Water Gun Battle, Story Telling, Treasure Hunting & Dolphin Watching! 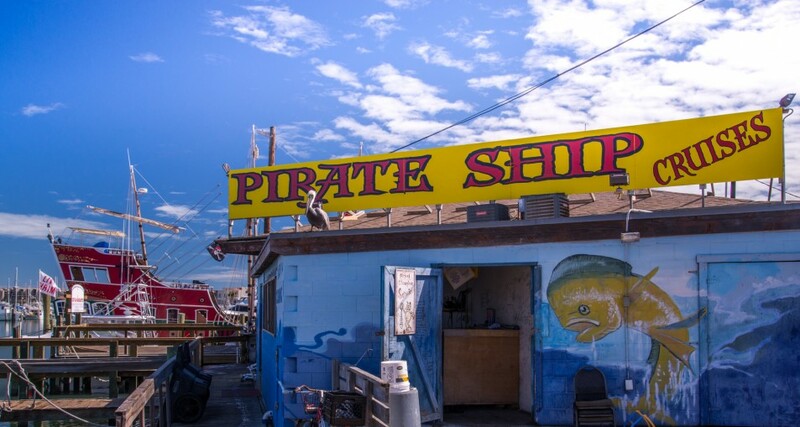 Red Dragon Pirate Cruises offers discount prices to local schools for field trips! This is a great opportunity for students and teachers to sail Aransas Bay, learn about Pirate Culture, local history, and have fun! Call to reserve for your class. All Red Dragon Birthday Parties include Dockside entertainment, full Pirate Adventure Cruise and the items listed below. Book with one week advanced notice for all birthday events to schedule your pirate themed adventure. 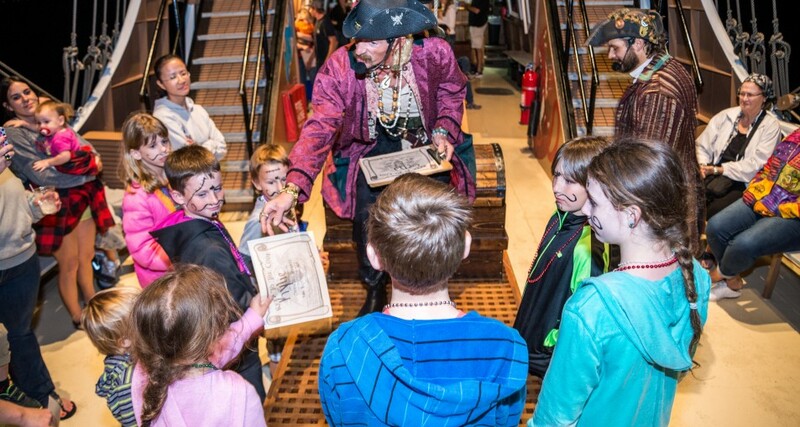 Each child will choose a piece of treasure from the special treasure chest aboard the Red Dragon. The Birthday Child will get to raise the birthday flag on the ship. The Pirates and guests will sing a “Happy Bath Day” song for the birthday child. Free photo of birthday child with all of the Pirate Crew. Our 4th of July Fireworks cruise starts off with the “Be A Pirate Adventure” cruise and then sails around the bay for one of the best views of the Independence Day Fireworks Show! Book early to guarantee your seat. 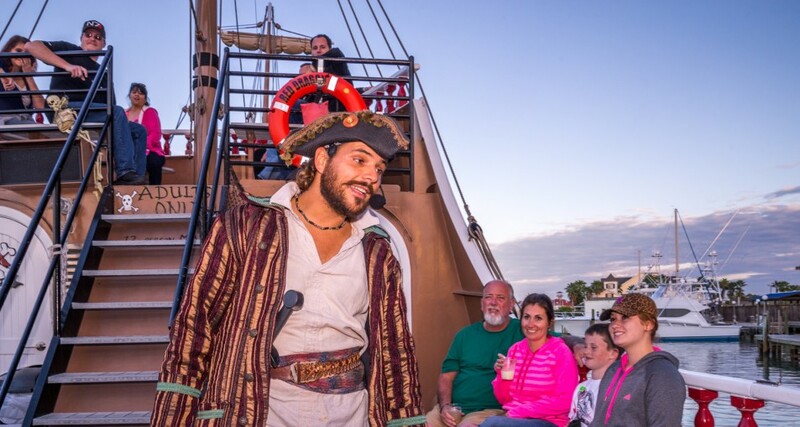 We offer private charter of our 70′ Pirate Ship for any occasion! Weddings, team meetings, birthdays, corporate events, parties, family reunions, and more! Our boat is equipped with clean restrooms, lots of shaded seating, a full bar with beer, wine and cocktails for purchase as well as bottled water, sodas and other non-alcoholic beverages.